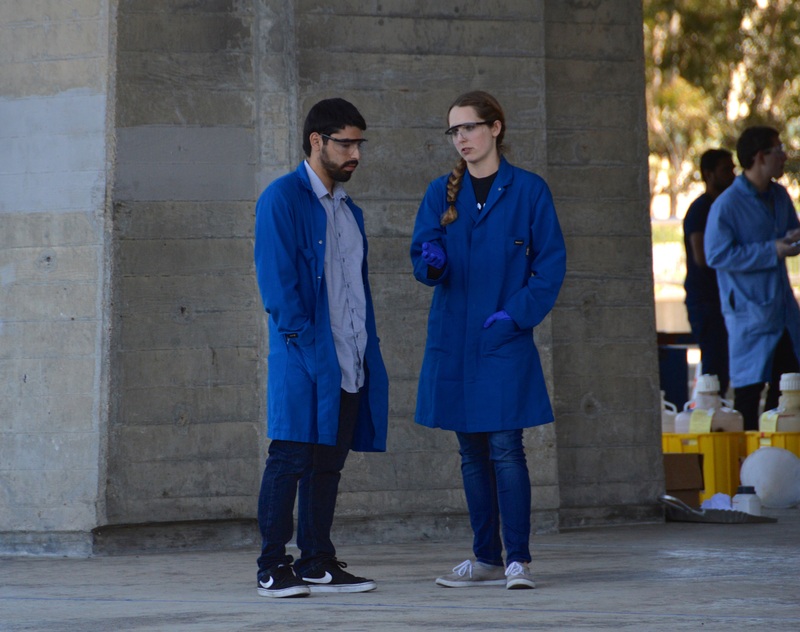 May 4, 2017 - UC Irvine’s Chem-E-Car team took first place at the American Institute of Chemical Engineers (AIChE) Western Regional competition, April 14-16, held at UC San Diego. 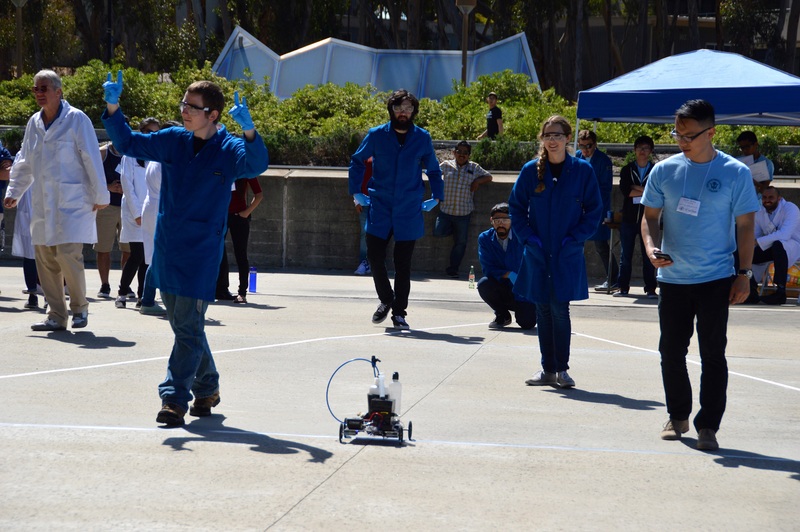 The Anteaters fielded two cars (Model S and Steve-O) and competed against nine others from seven schools. UC Berkeley and UCLA also entered two vehicles. 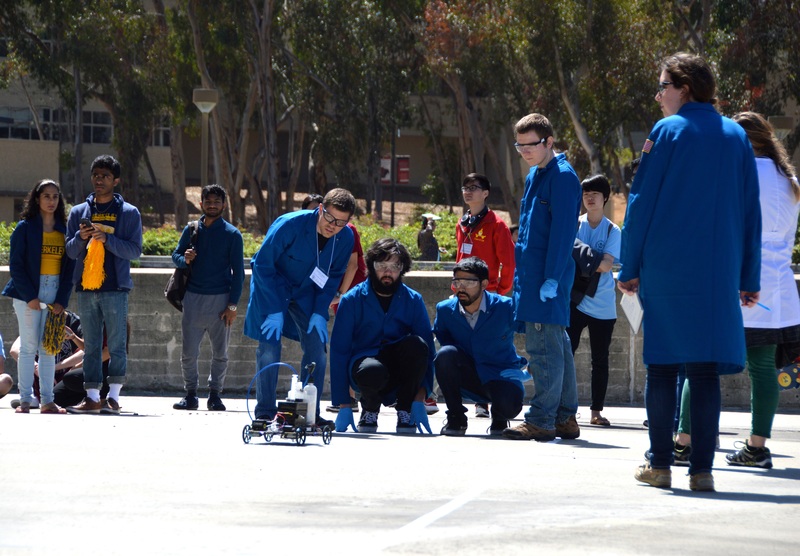 The annual competition challenges student teams to design and construct a chemically powered vehicle within certain size constraints. The car must start and stop based on a chemical reaction, carry a specified cargo and travel a designated distance. The teams learn the load volume and required distance just minutes before the competition begins. This year, the cars had to carry a water bottle with 100 ml of water and travel 17.1 meters. UCI’s Model S car finished in front of UCLA for best performance, and its Steve-O team came in first in the poster competition. 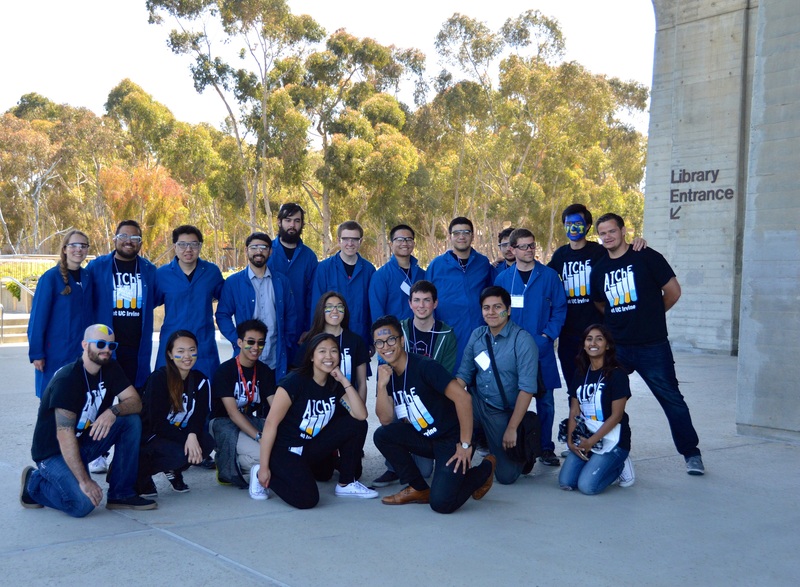 For the third year in a row, Anteater engineers will attend the national competition in the fall, this year in Minneapolis, Minn.. Last year, the Anteaters also took first place at regionals and competed at nationals. The UCI Model S car is equipped with a hydrogen fuel cell. It uses the reaction of hydrochloric acid and metal magnesium to create hydrogen gas. The gas flows from the reaction vessel to the fuel cell, which generates electricity for two motors that power the car. To stop the car, students employed a two-part clock reaction, using a timed mixture of diluted sodium thiosulfate and hydrochloric acid, an LED light and an Arduino sensor. 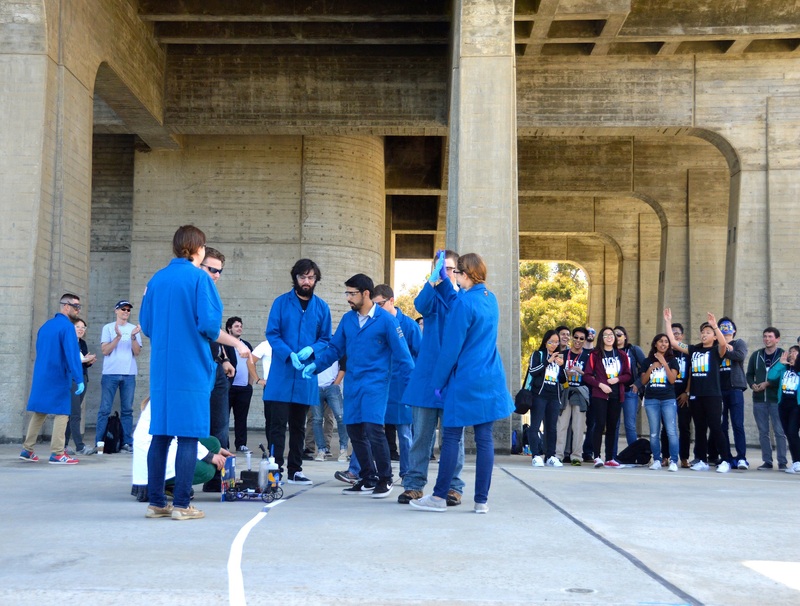 The students begin the car’s starting and stopping reactions simultaneously, by injecting the acid into a dark container holding the sodium thiosulfate. When the two solutions mix, they go from clear to cloudy. A sensor detects an LED light that shines through the solution from one side to the other. When the Arduino detects a quick decrease in light due to the injection, it signals the motor to turn on. When the reaction nears completion and the sensor receives almost no light because the LED is blocked by the opaque solution, the circuit directs the motor to stop. To vary Model S’s distance, the concentration of sodium thiosulfate is changed. Less sodium thiosulfate results in production of a less solid sulfur, allowing the sensor to receive the light longer and the car to travel farther. “Model S stopped at 17.43 meters, only 33 centimeters off,” said Sara Steinhauser, who served as project manager along with Farid Nasser. Both are third-year chemical engineering students. The team was “ecstatic” about its win. UCLA’s second-place finish stopped at 17.66, and USC’s car stopped at 15.33 for third place. “It was a solid win,” said Daniel Lapp, a team lead and a chemical engineering senior. UCI’s second car, Steve O had a tougher time. This car employed a zinc air battery for power and a luminol bleach reaction for stopping. The team aced the poster competition, which involves efficiently explaining how the car works, including all the different chemical reactions and safety features. But when it came time to run, one of the cells in the battery was not connected correctly so the car did not start. On its second run, the warm weather affected the luminol reaction, and the car would not stop running until it was well past the finish line. 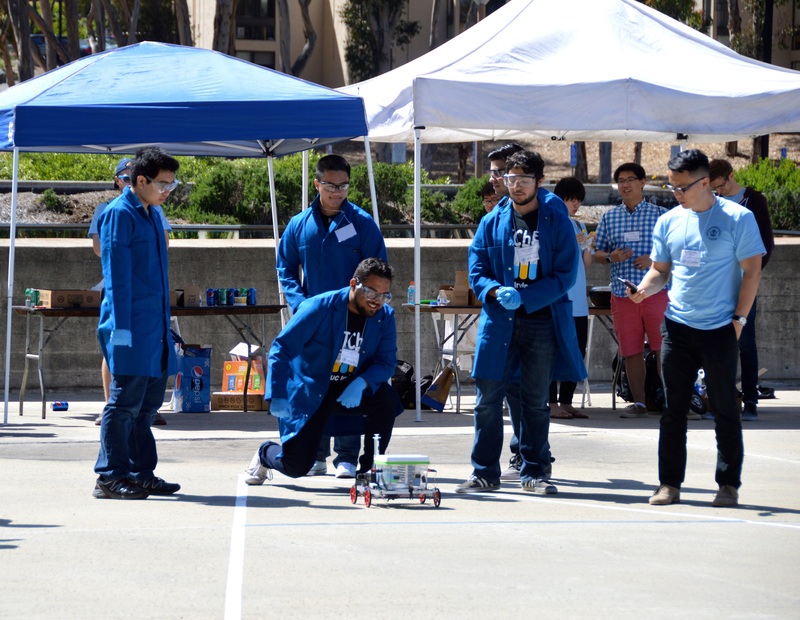 "Winning both prizes, the car race and poster competition, again for the second year in a row is a result of the countless numbers of hours that these team’s members put in tinkering and retesting their design," said Hung Nguyen, assistant professor of chemical engineering and materials science and the project's faculty adviser. Not only do they rightly deserve these prizes, but they are also well positioned for a rematch at the national competition in Minneapolis." Over the summer, the current Chem-E-Car team will refine its Model S car and explore possible effects of cold weather on the chemical reactions in preparation for the national competition in Minneapolis. And team members will begin training the sophomores to run the car. “They are the future of our club, so they need to gain the experience,” said Nasser.